Facts of Life, a Norman Rockwell painting , appeared on the cover of The Saturday Evening Post published July 14, 1952. 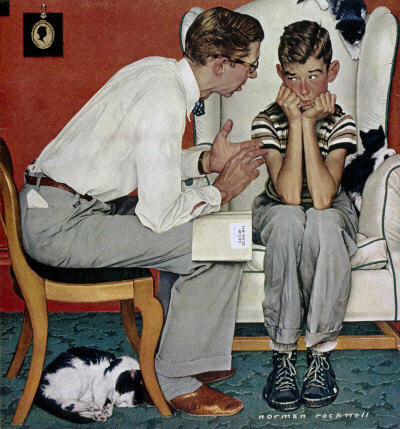 This is yet another favorite of Rockwell collectors, a classic enduring image of the world Rockwell painted. This painting was Rockwell's 268th overall out of 322 total paintings that were published on the cover of the Saturday Evening Post. Rockwell's career with the Post spanned 47 years, from his first cover illustration, Boy With Baby Carriage in 1916 to his last, Portrait of John F. Kennedy, in 1963. This was also the second cover for The Post in 1952. In 1952, there were three Norman Rockwell Saturday Evening Post covers published. This painting also appears on page 188 of Norman Rockwell, A Definitive Catalogue by Laurie Norton Moffatt. Two studies also appear on page 188 of the Norman Rockwell Catalogue. In this painting, Norman Rockwell shows us a familiar adolescent scene. The viewer can almost see the pain in this boy's face. His father is telling him about the birds and the bees. Chances are that he already knows or at least thinks he knows, He has probably heard the narrative in greater detail on the playground at school or in the boy's bathroom. That narrative was, no doubt, much more exciting than the one he is enduring right now. Well, at least he will have another point of view to compare it to. The boy has probably already witnessed the miracle of birth. There are two kittens and a mother cat in the room with the boy and his father. Facts of Life was only one of 322 Norman Rockwell Saturday Evening Post covers; Here is the list of Norman Rockwell Saturday Evening Post cover illustrations. Peter Rockwell has said that his father worked on this painting for eleven months. Rockwell was a painter who was very conscious of every detail in his paintings; every facial expression, every hand position and all the background had to be just right. It is no wonder that a subject as deep as this one took him so long to perfect. Do You Have A Great Story, Opinion Or Contribution About Facts of Life?